Based on China fertility survey 2017, this report presents the national fertility level, age-specific fertility rate and parity distribution. The survey results show that during 2006–2016 the mean ages at first marriage and first birth increased by 2.7 and 2.6 years respectively. From 2006 to 2011, the total fertility rate was around 1.60–1.70, and experienced notable fluctuations during 2012–2016. Compared the age-specific fertility in 2006 with in 2011, the curve in 2016 shifted significantly to the right side. Affected by the relaxation of the fertility policy, the proportion of second births among the total births had increased year by year since 2012. In this article, the parity is referred as the order of living birth. During 1982–2006, former National Family Planning Commission of China and then former National Population and Family Planning Commission of China conducted six national-wide comprehensive surveys on fertility, the six surveys are: National 1‰ Population Survey on Fertility in 1982, National Survey on Fertility and Contraception in 1988, the First Survey for National Family Planning Information System in 1992, National Survey on Population and Reproductive Health in 1997, National Survey on Family Planning and Reproductive Health in 2001, National Survey on Population and Family Planning in 2006. The data collected from the surveys provided important scientific basis for understanding the national trend of fertility and for the policy development. However, since 2006, this type of once-every-five-year national survey had been suspended, and Chinese fertility-related studies mainly relied on the population census, 1% population survey, annual surveys on population changes, and vital statistics from related government departments. In 2017, former National Health and Family Planning Commission of China organized a national representative fertility survey (Zhuang et al. 2018). The target population of China fertility survey 2017 (hereafter CFS 2017) was women aged 15–60 with Chinese citizenship living in China’s mainland at 00:00 July 1, 2017. The main contents of the survey include following four aspects, namely childbearing intentions, childbearing behaviors, childbearing experience and the use of services related to childrearing, and determinants of childbearing. A total sample size of 250,000 was chosen, and a total of 249,946 individuals were interviewed successfully. The methods of stratified three-stage and PPS (probability proportional to size) sampling were adopted in the survey. The outcome of the post-survey quality check shows that the birth data collected from this survey is reliable (Zhuang et al. 2018). To minimize the structural bias of the samples generated from the defects of sample frame, the ex post facto weighting was applied to the sample data. 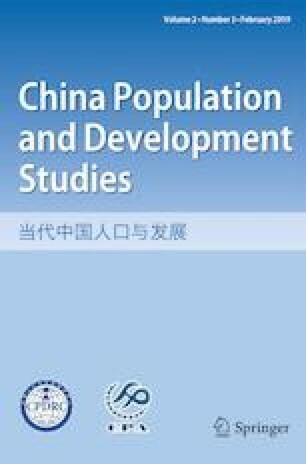 This paper presents preliminary results of China’s fertility status based on the weighted survey data. CFS 2017 shows a decreasing proportion of married women at the age of 20–34 during 2006–2016. There is a significant difference of proportion of married women between urban and rural areas. At the age of 20, only 1.4% women were married in urban areas, and 8.6% were married in rural areas; at the age of 25, 30.5% were married in urban areas and 66.2% were married in rural areas. At the age of 30, 82.0% were married in urban areas and 94.6% were married in rural areas. The mean age at first marriage of women at childbearing age shows a dramatic increase. The mean age at first marriage increased from 23.6 in 2006 to 26.3 in 2016, and specifically, in urban areas it increased from 24.6 to 26.9, while in rural area it increased from 22.8 to 25.6 (see Table 1). Great attention needs to be paid to the impact of the decreasing proportion of married women and the increasing mean age at first marriage on the fertility. Mean age at first marriage of women at childbearing age by urban and rural areas, 2006–2016. The total fertility rate during 2006–2016 fluctuated around 1.65 (see Table 2). As influenced by the 12 symbolic animals of the year, 2012 which was the lunar year of dragon saw the higher fertility rate at 1.78, while 2015 which was the lunar year of sheep saw the lower fertility rate at 1.41. Affected by the selective two-child policy and then the universal two-child policy, the total fertility rate in 2014 and 2016 was higher than that of its previous year, which stood at 1.67 and 1.77, respectively (see Table 2). Total fertility rate by Urban and rural areas, 2006–2016. The significant differences are found in the effect of the fertility policy adjustment on the fertility levels between urban and rural areas and between different regions. The total fertility rate in urban and rural areas in 2014 were 1.37 and 1.99, respectively, which increased by 0.16 and 0.17 each, compared with that of the year 2013. The total fertility rate in urban and rural areas in 2016 was 1.54 and 2.05, respectively, which increased by 0.17 and 0.06 each, compared with that of the year 2014. This shows that the fertility policy relaxation generated a greater impact on married women at childbearing age in urban areas. There are significant differences of the fertility levels among different regions. During 2006–2015, the total fertility rate of all regions shows a decreasing trend, while there are huge differences among various geographic regions. The highest total fertility rate was found in China’s Central region, which was 0.67 higher than the lowest total fertility rate in North-East region. The total fertility rate increased in 2016 as it was affected by the implementation of the universal two-child fertility policy. The total fertility rates in the East region, Central region, Western region and North-East region were 1.79, 1.90, 1.83 and 1.04, respectively. The highest total fertility rate found in Central region was 0.86 higher than the lowest one in North-East region (see Fig. 1). Total fertility rate by region, 2006–2016. CFS 2017 data shows that the total fertility rate of first birth decreased from 0.88 in 2011 to 0.67 in 2016, while the total fertility rate of second birth increased from 0.57 to 0.94 at the same time period, and there was not notable change in the total fertility rate of the third birth, fluctuating around 0.15. Affected by the introduction of the universal two-child fertility policy, the increase of total fertility rate of second birth enabled the increase of the total fertility rate as a whole (see Fig. 2). Total fertility rate by parity, 2006–2016. Table 3 shows the average number of children ever born to women aged 35–60, with number of children increasing by the ages of women. It is worthwhile to note that if 45 years of age is regarded as the age of completing childbearing, in the 16 age groups between 45 and 60 years old, only the fertility of 7 age groups between 54 and 60 years of age reached or approached the replacement level, while those of the other 9 age groups were lower or remarkably lower than the replacement level. The average numbers of children ever born to women at ages of 60 and 50 were 2.12 and 1.85, respectively. Average number of children ever born to women aged 35–60. The 3 years namely 2006, 2011 and 2016 were selected among the 11 years during 2006–2016 based on the principle of equal interval, and the comparison was made for the age-specific fertility of these 3 years, considering the factors on the analyses of fertility trend and the impact of the implementation of the adjusted fertility policy. 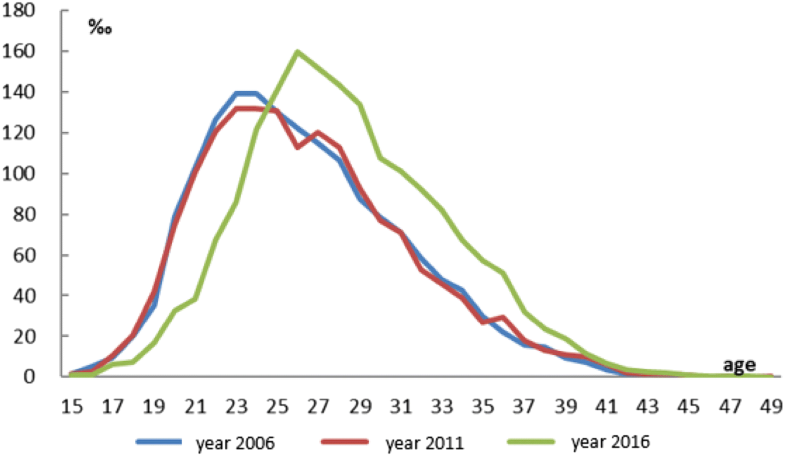 Figure 3 shows the distribution of age-specific fertility rate in the above-mentioned 3 years. The distribution of age-specific fertility rate in 2016 was shifted significantly to the right side, compared with that in 2006 and 2011. The age of the fertility peak in both 2006 and 2011 was 23 years old, and it increased to 26 years old in 2016. The fertility rates at childbearing peak age in 2006 and 2011 were 139‰ and 132‰, respectively, while a big increase was observed in 2016, standing as high as 160‰. It is worth noting that there was a decrease of fertility level among lower age groups in 2016, compared with that in 2006 and 2011. The delayed childbearing brought with the decrease of the accumulated age-specific fertility. However, as affected by the universal two-child fertility policy, compensatory fertility in the higher age groups increased substantially. The introduction of the adjusted fertility policy brought with the rise of the accumulated age-specific fertility (see Fig. 3). The mean age of women at first birth increased from 24.3 years old in 2006 to 26.9 years old in 2016, while that of women at second birth increased from 29.2 years old in 2014 to 30.2 years old in 2016, which is caused by having second birth at a later age among women at childbearing age after the fertility policy relaxation. There was no notable change of mean age of women at third birth and above (see Table 4). Mean age at birth by parity, 2006–2016. Table 5 shows the parity distribution of children born during 2006–2016. The survey data tells that there was a general decrease of the proportion of first child among all the children born during 2006–2016, and there was a decrease at the beginning and afterwards an increase of second child. There was a small fluctuation of the proportion of third child and above around 10%. Parity distribution of newborns, 2006–2016. Since 2012, there had been a regular change in the proportion of first birth and second birth, that is an increase of the second birth and a decrease of first birth year by year. The increase of the second birth relieved the pressure of the decrease of the number of births caused by the decrease of the first birth. It also means that the decrease of the proportion of the single-child families may have a great significance for adjusting family structure and strengthening family support. 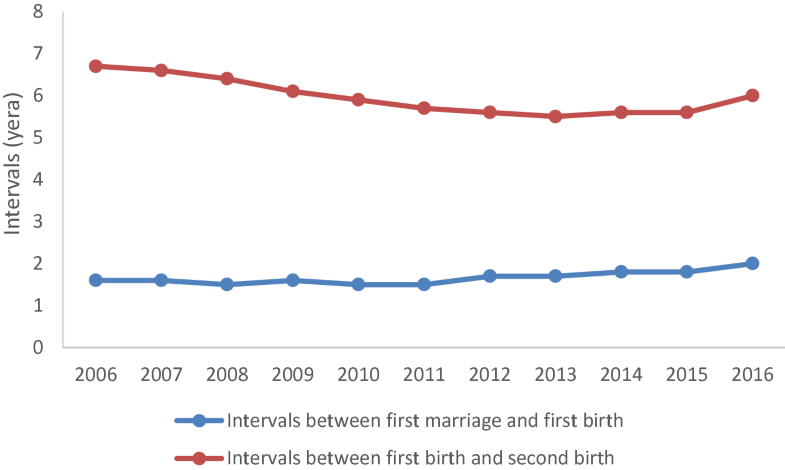 Since the mean age at first marriage and first birth increased at different pace in each year during 2006–2016, the intervals between the first marriage and the first childbirth show a trend of decreasing at the beginning, followed by a moderate increase. It decreased slightly from 1.6 years in 2006 to 1.5 years in 2010, and then increased to 2.0 years in 2016. The interval between the first birth and second birth reduced from 6.7 years in 2006 to 5.9 years in 2010. There was a marginal fluctuation between 5.5 and 5.7 years during 2011–2015 and the interval increased to 6.0 years in 2016 (see Fig. 4). 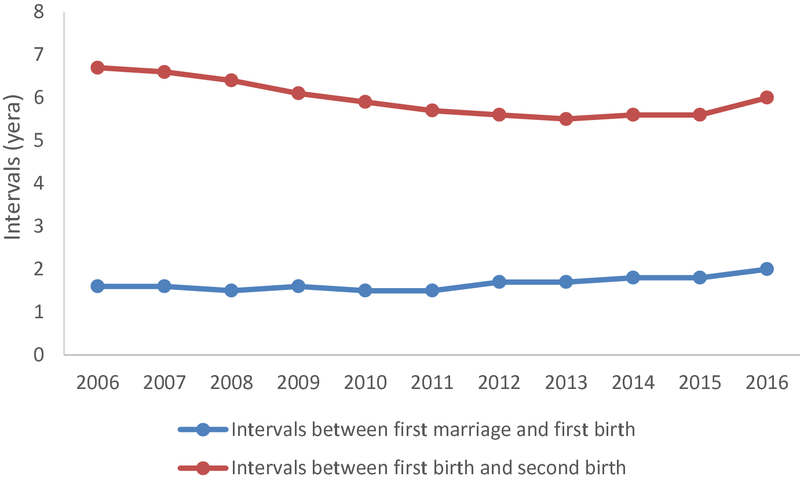 Intervals between first marriage and first childbirth and between the first and second births, women at childbearing age, 2006–2016. This report presents a preliminary result on the current fertility status of China based on the data collected from China fertility survey 2017. The results show the following trends: first, the total fertility rate was around 1.60 during 2006–2015. As affected by the implementation of universal two-child fertility policy, the rise of the fertility rate of the second birth led to the increase of the total fertility rate to 1.77 in 2016. Second, the distribution of age-specific fertility rate shifted to the right side substantially, which reflects the release of the fertility potential as expected. Third, the gaps among fertility levels in the East region, Central region and Western region narrowed gradually. The fertility level in the North-East region remained very low for a long time period. There have been some effects of the fertility policy on the changes of fertility levels. However, other factors, including economic and social development, policies supporting childbearing and childrearing, and infertility will also have important impacts on the fertility changes. Concerning the future fertility trend of China, the authors believe that under the current situation, the fertility rate may continue to decline if there is no stronger intervention to be in place. China fertility survey 2017 has provided rich information on the fertility status, fertility intention, contraceptive use, and public services for childbearing and childrearing in current China. More analyses and results of the survey will be reported.